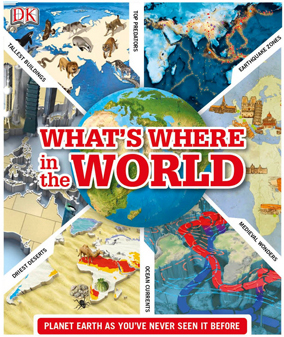 Encompass Graphics recently received a complimentary copy of Whats Where in the World ? published by Dorling Kindersley. The book is a rather unique visual encyclopaedia that sets out to explore our world through 75 dynamic 3d maps. Diverse topics on geography, nature, people, history, arts and entertainment as well as science and technology are all covered. Many of the maps draw on the wealth of free data that is available and Encompass Graphics were asked to streamline the plotting of data using ArcGIS. Data was formatted with XY values, in decimal degrees and converted to shape files or geodatabase feature classes in Arc Map. Custom symbols were designed in Illustrator and imported into ArcMap.